Toddlers love to be helpful and cooking is no different — often much to the chagrin of mom and dad. But if you’re prepared and willing to throw a bit of caution to the wind, cooking with young kids can be fun and rewarding. Not only that, getting toddlers involved in the kitchen lays the foundation for valuable life skills as well as helps toddlers develop an understanding of where food comes from and how to eat healthy. To get your toddler involved in the cooking process, try these tips and ideas. A dedicated workspace for your toddler can help keep him contained and away from unsafe surfaces –like stove burners. Use a safety step stool at the counter or set up kid-friendly kitchen tools at child-sized table. 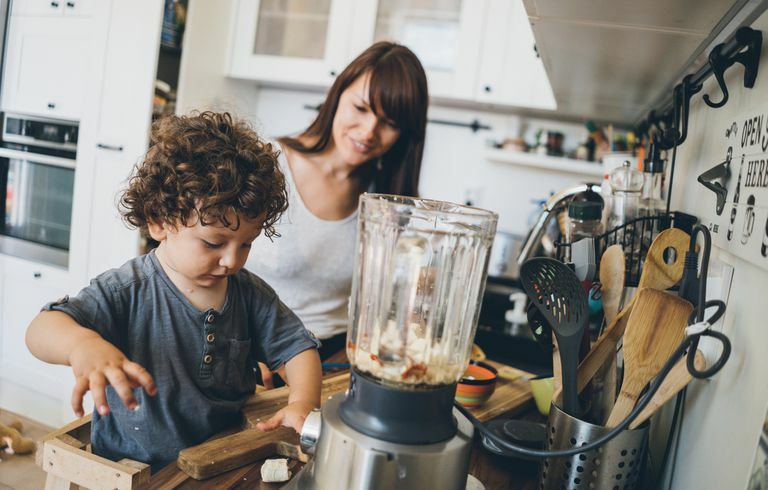 Forget about finding the appropriate kitchen tools for your toddler, and instead, get her involved in activities that allow her to use her hands to roll, flatten or mix. Just make sure your toddler’s hands are clean before you start cooking. Another easy task for toddlers is smashing and mashing. Let your toddler take care of mashing bananas for banana bread or banana muffins, softened (and cooled) potatoes for mashed potatoes, and avocados for guacamole. Toddlers love playing with water, which makes rinsing produce an easy and fun task for little ones. Put a safety stool at the sink and let your toddler clean veggies and fruits. Get your toddler cooking with easy recipes that require only a few ingredients and some mixing. Bread and muffin box mixes are perfect for the novice toddler-chef. Toddlers love feeling like they are getting something special all to themselves, so consider making recipes that lend themselves to individual or mini-portions. Invest in mini-loaf pans for breads or use small pitas for individual pizzas. Tried and true, you can't go wrong with decorating cookies as a special treat. To make it even easier, skip baking with your toddler, and let him get creative with already-made cookies. Use a spoon or plastic knife to spread icing, and decorate with sprinkles, chocolate chips, and other edible goodies. If a cooking project isn’t fit for toddlers, sometimes just allowing them to play with a set of bowls and spoons will keep them happy and make them feel engaged in the process. Put your toddler on spice duty. Either measure spices out before handing them over to a toddler or keep an eye out to make sure your little one doesn’t dump an entire shaker of salt into a dish. If your toddler is interested in food and cooking, plant a small garden in your yard. She’ll love seeing the plants grow and picking fresh produce. A toddler can create his own pizza by spreading sauce, sprinkling cheese and adding his choice of (healthy) toppings. If your toddler is picky, incorporate foods you want them to try into cooking projects. They'll likely be tempted to taste test whatever you are making, so bring on the fresh veggies and fruits. Enlist your toddler's help with cleanup. Young kids can sweep, put items away in low cupboards, and throw away trash or recyclables.